Above: Two of the stars are a contact binary, meaning they share the same atmosphere. The system, designated 1SWASP J093010.78+533859.5, consists of two sets of eclipsing binary stars, and a fifth lone star. Quintuple star systems have been discovered before, but this is the first time scientists have ever seen a pair of eclipsing binaries within a five-star system. The details of this extraordinary finding have been published in the science journal Astronomy & Astrophysics. Image: Artistic impression. Smaller orbits are not shown to scale relative to the larger orbit, as the binary components would be too close together to distinguish. The inset images are to scale, along with an image of the Sun for comparison. The blue dotted line marks the orbital path of the two pairs of stars. The fifth star, whose position is uncertain, is to the right of the left pair. (Image and caption credit: Marcus Lohr). The system, located 250 light-years from Earth, was originally detected in archived data from the SuperWASP (Wide Angle Search for Planets) project, a configuration of small, low-cost cameras at the Observatorio del Roque de los Muchachos in the Canary Islands, and at the Sutherland Station of the South African Astronomical Observatory. Over the years, these cameras intermittently measure the brightness of individual stars, allowing scientists to track their brightness over time. Using a technique similar to how astronomers discover distant exoplanets, a team of astronomers led by Marcus Lohr of the Open University, UK, was able to monitor and analyze changing light curves to uncover the unique details of this remarkable quintuple star system. Two of the stars are a contact eclipsing binary—a stellar configuration in which two stars are orbiting so closely together than they share the same atmosphere; from a distance, it would look as though they’re touching. 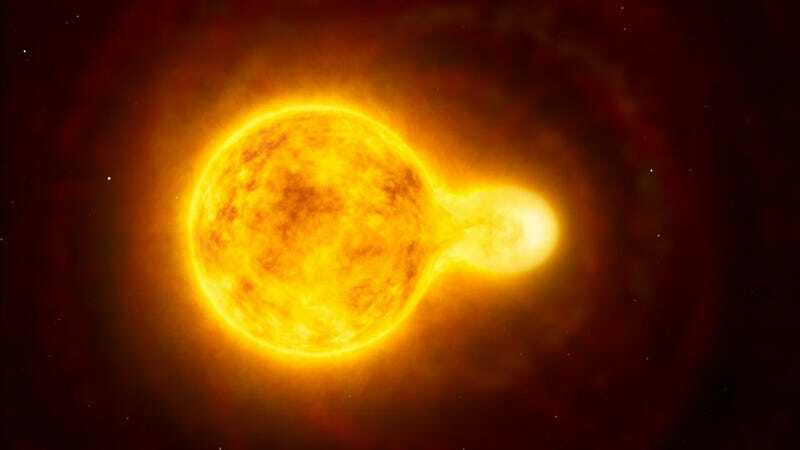 Contact binaries aren’t rare, but this one is unique in that it features a particularly short orbital period; it takes just six hours for these two stars to orbit one another. As for the other binary, its two detached stars are located about 21 billion kilometers from its companion binary, which is a distance somewhat larger than Pluto’s orbit around the Sun. Further analysis revealed a fifth star, up to two billion kilometers away from the detached binary, but it’s not producing any additional eclipses. By studying the system’s light curves and their spectra, the astronomers confirmed that they’re all gravitationally bound together in a single system. This is a truly exotic star system. In principle there’s no reason it couldn’t have planets in orbit around each of the pairs of stars. Any inhabitants would have a sky that would put the makers of Star Wars to shame– there could sometimes be no fewer than five suns of different brightnesses lighting up the landscape. Days would have dramatically varying light levels as the different stars were eclipsed. They would though miss out on night for a large part of their ‘year’, only experiencing darkness (and a night sky) when the stars were on the same side of their world. All of the stars are smaller and cooler than our Sun, but collectively the system is still bright enough to be seen with small telescopes. Amateur astronomers should be able to see the eclipses for themselves; the system, at a 9th magnitude, is located in the constellation Ursa Major. Read the entire study at Astronomy & Astrophysics: “The doubly eclipsing quintuple low-mass star system 1SWASP J093010.78+533859.5”. A pre-print version can be found at arXiv. Contact the author at george@io9.com and @dvorsky. Top image by ESO.